Regardless of the type of person this individual may or may not have been, I greyed out the personal information out of respect. I took this photo earlier this year. 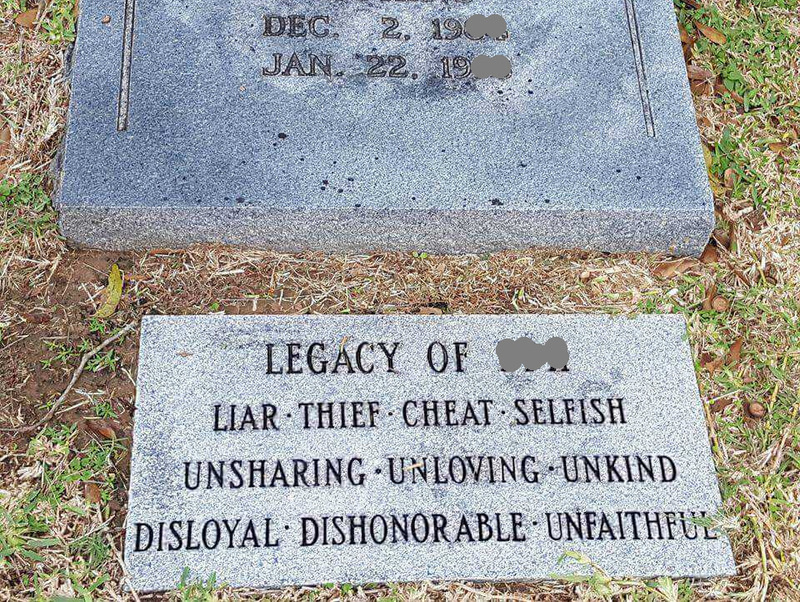 It is an actual grave marker in a local cemetery. Headstones and markers don’t typically make my photo ops list, but, for obvious reasons, this one caught my eye. It’s hard to find the words to even begin to express my thoughts about this marker, so I guess I will go with the one that speaks to me most forcefully. Life is too important to carve your hurts into stone. I’m not telling you that you shouldn’t be angry. I’m not saying that some person who has hurt you doesn’t fit this description. But locking those words in with such conviction doesn’t change the past. Most people wouldn’t dare to carve these judgements into literal stone, but so many of us carve them into our hearts instead. We allow our past and our memories to harden our emotions. We judge others based on what might happen because we remember being torn down until we were bruised and broken. We refuse to expose anything raw and soft and vulnerable in ourselves to avoid being shattered once more. But the savage truth is that I have also been all of these things. It makes me scream inside to own those words, but they are true and I could list numerous people who could confirm that in a heartbeat. It is the dark side of my humanity that I want to lock away but refuses to stay banished. I have been a liar, a thief, and a cheat. I have been selfish, unsharing, unloving, and unkind. I have been disloyal, dishonorable, and unfaithful. It makes my heart ache to write those words because I feel utter shame at the memories that flood my mind. My throat gets a heavy feeling and my cheeks grow warm at the memories of mistakes. Moments of terrible judgement. Words spoken in jealousy and fear. Anger leading me to lash out. And impatience. Always impatience. But that is only one side of the coin. I have also been extremely honest, fiercely protective, and fair. I have been generous, loving, kind, and warm. I have been loyal, honorable, and faithful. We each have darkness and lightness within us. There cannot be one without the other. This is not a fluke in our design. It is part of our human experience. We aren’t broken. We are here to develop and to grow. I’m not suggesting the you run full speed with your dark side. Don’t do that. Please. I’m merely offering the idea that we learn from the heavier moments. We strive for better. We remind ourselves to stand back up whenever we fall down. And we offer that possibility to those around us. Sometimes you can work through the pain to heal a relationship, and sometimes you can’t. Remember that you don’t have to have to keep people in your life in order to forgive them. That isn’t always healthy, and it isn’t always possible. However more often than not, the real person we need to forgive is ourselves. We are human, and we behave as such for better and for worse. Smooth the hurts you have carved into your heart. Set free any judgements you can or at least try to see them in the light of reality. Do it for your sake. We all make mistakes. We all fall down. We all fall short. We are two sides of the same coin. There is such beauty in our lives of contrast and in our drive to be more than what we have been. We must be one step lower before we can take the next step up. Release the hurt. Forgive others and forgive yourself. Step up from wherever you are in this moment. Always step up. It makes me sad, too. That’s a lot of money to pay for carved pain. It’s sad for both of them. Very clear and fair. You covered both sides and let us realize on our own thru your words how the markers were wrong. Maybe they weren’t. I just know that the person in my mirror fits those descriptions sometimes, too. I’m sadder for the person who paid to have it carved than the one it sits on. He’s gone. The other is still here and clearly hurting. It’s amazing what we do to each other in spite of or to try to get over things. I agree. Getting even never really evens things out in the long run. Your post reflects that – and it’s too bad that some people cannot find easy ways to let go of the pain… Perhaps their example reminds us how not to be. Lovely post… How’s your hand, btw, or are you still typing with your toes?!! As for the post, yes it makes me sad for them, too. Some people are mean beyond belief but holding onto it with such ferocity has to eat someone up inside. It was shocking but it also made me very sad to see it. ps. i said, ‘your post reflects that’ but actually it’s the image that reflects it! I knew what you meant lovebug! It sounds to me like you are the wise one. I mean that Tracy. Is there anyway to write about it in a way that allows you to set some small part of that free without talking specifically about it? Or maybe you write it. I mean you really write it and you go into every detail you can imagine, but then you don’t post it. Or you mark it private so no one can see it, but you have gone through some of the emotion clearing at that point. Also just to clarify on a totally separate note, the element of the post that spoke to me with regard to you (in addition to my very sincere comment about how you inspire me – you truly do) was one of accepting the duality of who we are and knowing that we aren’t broken because of that contrast. We are actually better because of it, but so often, it doesn’t feel that way. ‘Step up’ – I love that. Your post really speaks to my heart. I have hurts about a family member that are etched deep, and forgiveness is SO hard… But there is such wisdom in your words about seeing the best in people, for our own sakes. There is dark and light in all of us, I agree. And it’s only by God’s grace that we’re saved. We’re all works in progress. I hope I can find the courage to resist the anger and step up. Jo it’s not savage of you to admit you’ve been those things, because in truth we all have perhaps the only deceitful part of blogging is understandably we only wish to portray the good side of ourselves, human nature! I’ve been out walking with that head marker on my mind. Such a sad message etched into stone, my guess is the incumbent wasn’t evil or violent, more probably sociopath with narcissistic tendencies mean spirited or perhaps I assume unfaithful as adultery, but my overwhelming feeling is revenge isn’t sweet, it’s self destructive. Food for thought! Isn’t is unbelievably thought provoking? I absolutely agree with you Andrew. I keep thinking about all the stuff in it and know that everyone can be all of these things. I just hope that I don’t end up leaving someone with that final impression of me for their sake or mine. Thank you for saying that. You can’t imagine how much that meant to me Jan. Truly. This is a beautiful piece. We’ve all done terrible things, and we’ve all done selfless things. That’s just human nature. But it takes awhile for people to figure this out. I’ve become a big believer in forgiveness….because no one is perfect…..everyone has moments. No one wants to admit that they’ve done bad things- especially to themselves. You show so much courage every time you write! Thank you! Aw thank you lovebug. I have been thinking about you and sending lots of love and light your way. How are you darling? Ugh yuck and bleh!! I’m so so sorry girl. That is “crappy” to say the least. Are you on the mend at this point or still feeling beat up? I hate that for you honey. I’m so thankful to hear that girl. What a terrible few days you went through! Email me. Talk to me goose. How is your hand jo?? I cant tell you enough how much I respect this post. You nailed it sister. Where there is darkness, there is light. And where there is human kindness, there is human error. Thank you for this beautiful comment my friend. You are so right. Your comment made me smile. Thank you love. Enter your email address to follow blog and receive notifications of new posts by email. Parenting Struggle – Is Conformity Helpful or Harmful?